Successful parathyroidectomy requires an understanding of both the anatomy and the embryology of the parathyroid glands. The parathyroid glands arise from the dorsal endoderm of the third and fourth branchial pouches. The vast majority of patients have a total of 4 parathyroid glands: 2 superior and 2 inferior. The inferior parathyroid glands, which arise from the third branchial pouch, initially migrate with the thymus until they separate to take their final position, usually at the level of the inferior pole of each thyroid lobe. The superior parathyroid glands (see the image below) arise from the fourth branchial pouch, follow the migration of the ultimobranchial bodies, and usually take their final position along the posterior part of the middle third of each thyroid lobe. The superior parathyroid glands show less anatomic variation than the inferior thyroid glands do. Normal-appearing right superior parathyroid gland seen on unrelated thyroid surgery. The parathyroid glands have a distinct, encapsulated, smooth surface that differs from the thyroid gland, which is has a more lobular surface, and lymph nodes, which are more pitted in appearance. The color of the parathyroid glands is typically light brown to tan, which relates to their fat content, vascularity, and percentage of oxyphil cells within the glands. The yellow color may be confused with surrounding fat. A distinct hilar vessel is also present that can be seen if the surrounding fat does not obscure the glands' hila. For more information about the relevant anatomy, see Parathyroid Gland Anatomy. Most parathyroidectomies are performed for primary hyperparathyroidism. 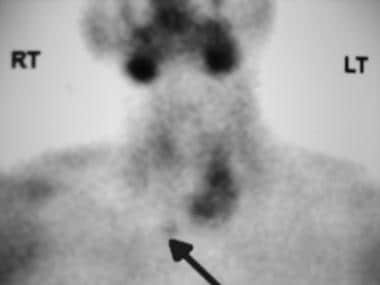 The most common cause of primary hyperparathyroidism is parathyroid adenoma (see the image below), which accounts for 75–90% of cases. Most parathyroid adenomas are not genetic but sporadic, and they involve all parathyroid glands equally. Parathyroid adenoma (7 g) removed from posterior mediastinum via cervical approach. Preoperative sestamibi scan was incorrectly read and showed inferior parathyroid adenoma; however, lesion was found to be superior parathyroid adenoma, located in ectopic location in posterior mediastinum. Between 5% and 25% of cases of primary parathyroid hyperplasia involve multi-gland disease. Historically, it was felt that this included dobule parathyroid adenomas and 4-gland hyperplasia. While most authors believe that double parathyroid adenomas do occur, it is unclear how prevalent they are. When individual patients with double adenomas are followed over a long period, some experience recurrence of hyperparathyroidism and are ultimately diagnosed with 4-gland hyperplasia. This is further complicated by the fact that 4-gland hyperplasia can be asymmetric with some glands being very large and other glands appearring closer to normal in size, shape, and appearance. In 2012, Norman et al. published on more than 15,000 parathyroid cases. In the cohort of 3000 patients that had bilateral operations, aproximately 75% had one gland removed, 17% had two glands removed, 5% had three glands removed, and about 3% had three and a half glands removed. Parathyroid cancer is rare and accounts for fewer than 1% of cases of primary hyperparathyroidism. The parathyroid glands are involved in calcium homeostasis. They release parathyroid hormone (PTH) in response to low serum concentrations of ionized calcium, and the release of the hormone is inhibited by an increase in serum ionized calcium. PTH causes the kidneys to increase the tubular resorption of calcium and decrease the resorption of phosphorus. PTH also acts on bone and the intestine to increase serum calcium levels. Primary hyperparathyroidism occurs when the PTH level is inappropriately elevated in relation to the serum calcium level. In normal circumstances, a negative feedback loop exists in which the PTH level drops in response to an elevated serum calcium level. This does not occur in the setting of primary hyperparathyroidism. Secondary hyperparathyroidism occurs when the PTH is elevated as the result of another cause. Vitamin D deficiency and renal failure are the 2 most common causes of secondary hyperparathyroidism. Tertiary hyperparathyroidism occurs when glands affected by secondary hyperparathyroidism become autonomous and are no longer controlled by the normal feedback mechanisms. An example would be a patient with secondary hyperparathyroidism from chronic renal failure who undergoes a renal transplant that corrects the renal failure but who continues to have inappropriate release of PTH. Although patients may be referred with nothing more than elevated calcium and PTH levels, further questioning often reveals that they have nonspecific symptoms such as fatigue, musculoskeletal pains and aches, depression, constipation and abdominal discomfort, and decreased memory. These patients may be more accurately described as minimally symptomatic, rather than asymptomatic. Many of them will derive symptomatic benefit from parathyroid surgery, though such benefit cannot be guaranteed in advance. The diagnosis of primary hyperparathyroidism requires, minimally, an increased serum total calcium level with an increased intact PTH level—or, at least, an inappropriately high normal PTH level. Serum calcium levels can fluctuate somewhat over time, but patients with primary hyperparathyroidism should have a documented increase in serum total or ionized calcium sometime during the course of the condition. Patients with an elevated intact PTH level and a calcium concentration in the normal range often have secondary hyperparathyroidism. Secondary hyperparathyroidism can result from insufficient calcium or vitamin D intake, decreased intestinal calcium absorption, vitamin D malabsorption, or renal hypercalciuria. Depending on the cause of secondary hyperparathyroidism, surgery may or may not be an appropriate treatment option; therefore, it is important to distinguish primary from secondary hyperparathyroidism before deciding on surgery for presumed primary hyperparathyroid disease. For this reason, vitamin D levels should be checked preoperatively to rule out vitamin D deficiency, which can be a cause of elevated PTH. Sometimes patients may present with a high PTH, low vitamin D, and a calcium within the high normal range. Often in this case, once the low vitamin D is corrected the patient will develop an elevated calcium, and if the PTH remains elevated, now fit the classic presentation for primary hyperparathyroidism. A 24-hour urine calcium and creatinine test should also be administered to rule out familial hypocalciuric hypercalcemia (FHH). To further complicate matters, a new clinical entity called normocalcemic primary hyperparathyroidism has been introduced. Normocalcemic primary hyperparathyroidism is when the calcium is normal and the PTH is persistently elevated and secondary causes of hyperparathyroidism, such as chronic kidney diease, vitamin D insufficiency, malabsorbtion syndromes, and side effects from medications such as lithium and thiazides have been excluded. [6, 7, 8] Some of these patients may also benefit from surgery. Although not included in the criteria, there is some conflicting evidence to suggest that primary hyperparathyroidism contributes to cardiovascular disease. [13, 14, 15] Some authors believe that the cardiovascular risks, as well as other nonspecific symptoms, can improve in patients with primary hyperparathyroidism who do not meet the above cirteria. [14, 12] It must be kept in mind that these guidelines are for asymptomatic patients. They do not apply, for example, to patients with a history of painful kidney stones for whom surgery is automatically indicated. The decision whether to provide surgical therapy for asymptomatic patients and those with minimal symptoms can be complicated. Often, the patient’s wishes, the surgeon’s experience, and the results of localization studies exert a substantial influence on this decision. Parathyroid surgery is contraindicated in patients with familial hypocalciuric hypercalcemia (FHH). Patients who have this disorder can present with elevated calcium and PTH levels, mimicking the serum biochemical characteristics of primary hyperparathyroidism. However, FHH is not treated surgically. Thiazide diuretics and lithium excess can cause elevated PTH and serum calcium levels, mimicking primary hyperparathyroidism. Therefore, it is important to consider these medications when taking a history and to carry out further investigation if necessary before proceeding with surgery. As localization studies become more frequent, patients may be directly referred for surgery by their primary doctors with a presumed indication based on such studies. In this situation, it is important to rule out not only FHH but also forms of secondary hyperparathyroidism in which surgery may not be appropriate. Furthermore, all localization studies have some false positives, and these can further confuse the picture. Negative localization studies, however, are not a contraindication for surgery. If the patient clearly meets the criteria for primary hyperparathyroidism based on blood and urine tests, then they should be referred to an experienced surgeon for consultation regardless of the localization tests. Given surgeon preference for imaging, it may be most efficient to hold off on ordering localization studies and simply refer the patient to an appropriate surgeon who can then arange for imaging. Historically, a comprehensive 4-gland parathyroid exploration has been the traditional standard. With the introduction of the Sestamibi scan in the 1990s surgeons started to move towards doing unilateral and targeted surgery. The proponents of this approach argued that operating time and hospital stay can be decreased by performing targeted or unilateral parathyroid surgery. Proponents of this approach argued that this allows for smaller incisions, regional anesthesia, and same-day hospital discharge  and that it may also reduce the risk of laryngeal nerve injury and postoperative hypocalcemia. These presumed advantages notwithstanding, not all surgeons favor 1-gland or unilateral surgery. Some experienced surgeons advocate the return of bilateral parathyroid surgery. [20, 21, 2] However, even though these authors argue in favor of bilateral surgery, they still use technetium Tc 99m sestamibi scintigraphy before the operation and parathyroid hormone (PTH) assays or a gamma probe during the operation. Intraoperative PTH assay is often employed to predict surgical cure in patients with primary hyperparathyroidism. [22, 23, 24, 25, 26, 27, 28] Guidelines for its use are available from the National Association of Clinical Biochemistry. Some authors measure preincision PTH levels, and some measure preexcision levels after the abnormal gland has been identified but before it is removed. Some authors check postexcision levels at 5 minutes, 10 minutes, 15 minutes, and 20 minutes after removal of the abnormal gland. In most situations, 10-15 minutes after the abnormal gland is removed, the PTH sample should be within normal limits and should have decreased by more than 50% from the initial baseline value. [30, 26] If the PTH level does not decrease by 50% and fall into the normal range, the surgeon should continue with 4-gland exploration, or, at least, should continue exploring until additional abnormal parathyroid glands are identified and removed and the PTH level is in the normal range and 50% or more below the starting value. These 3 images are from a four gland parathyroid exploration surgery with removal of a total of three parathyroid glands. The preoperative imaging showed an enlarged left superior parathyroid gland and it was also suggestive of a large right inferior gland. This left superior gland weighed 748 mg; the right inferior gland weighed 507 mg and the right superior gland weighed 300 mg. The left inferior gland looked to be of a normal size and shape. The initial pre-operative PTH was 111 and the final PTH was 17. If the left inferior gland had appeared enlarged or if the final PTH was high or in the upper normal range, then a three and a half gland resection would have been more appropriate. These 3 images are from a four gland parathyroid exploration surgery with removal of a total of three parathyroid glands. The preoperative imaging showed an enlarged left superior parathyroid gland and it was also suggestive of a large right inferior gland. This right inferior gland weighed 507 mg; the left superior gland weighed 748 mg and the right superior gland weighed 300 mg. The left inferior gland looked to be of a normal size and shape. The initial pre-operative PTH was 111 and the final PTH was 17. If the left inferior gland had appeared enlarged or if the final PTH was high or in the upper normal range, then a three and a half gland resection would have been more appropriate. These 3 images are from a four gland parathyroid exploration surgery with removal of a total of three parathyroid glands. The preoperative imaging showed an enlarged left superior parathyroid gland and it was also suggestive of a large right inferior gland. This right superior gland weighed 300 mg; the left superior gland weighed 748 mg and the right inferior gland weighed 507 mg. The left inferior gland looked to be of a normal size and shape. The initial pre-operative PTH was 111 and the final PTH was 17. If the left inferior gland had appeared enlarged or if the final PTH was high or in the upper normal range, then a three and a half gland resection would have been more appropriate. However, making a patient hypoparathyroid is often worse than having the patient be mildly hyperparathyroid. This is where surgical experience and judgment becomes critical. The pictures above are from a 4-gland parathyroid exploration. The smallest gland, which looked to be normal in size and shape, was left intact given that the PTH had already come down from 111 to 17. If all four glands look equally enlarged, three-and-a-half-gland surgery is sometimes necessary. 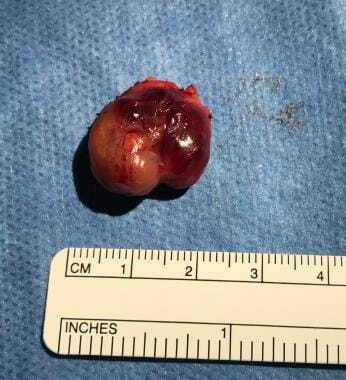 In this situation, rather than removing three glands, and then trying to remove half of the remaining gland, it may be best to try to remove half of a gland first and see if the remaining half still looks like it has an intact blood supply. Technically, it can be difficult to remove half of a gland without disturbing the blood supply. If all glands look the same, you have more than one chance to do this if you attempt this before removing all but one gland. Some surgeons perform intraoperative laryngeal nerve monitoring with special endotracheal tubes that have electromyographic (EMG) capability. This may be particularly helpful in revision cases, in which the recurrent laryngeal nerve may be involved with surrounding scar tissue. Like many newer technologies, intraoperative laryngeal nerve monitoring has encountered varying degrees of acceptance, depending on the institution. It is certainly not possible in operations using local anesthesia with sedation or laryngeal mask airway anesthesia. As in thyroid surgery, a low cervical incision, usually between 2 and 4 cm long, is made approximately 2 fingerbreadths above the suprasternal notch; this is known as a Kocher incision. Dissection continues through the platysmal muscle, and the subplatysmal flaps are raised. If a localization study suggests a unilateral abnormality (see the images below), then the thyroid is mobilized first on that side. 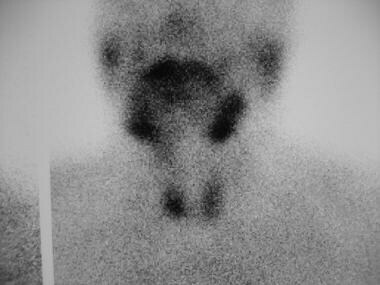 Sestamibi scan of localized parathyroid adenoma. Parathyroid adenoma seen in preceding image removed through 3-cm midline incision. Intraoperative parathyroid hormone (PTH) level went from 170 to 34 pg/mL after excision of adenoma. Dissection continues along the thyroid capsule, and the thyroid gland is rotated anteriorly and medially. If a preoperative localization study suggested either a superior or inferior gland, the corresponding area is examined first. 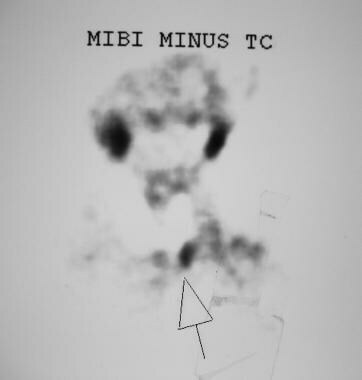 However, the standard parathyroid Tc 99m sestamibi scans may be misleading. For example, what looks like an inferior parathyroid adenoma on the scan may in fact be a superior gland that has descended posteriorly and inferiorly along the tracheoesophageal groove. The location of the superior parathyroid gland is sought on the posterior and lateral aspect of the thyroid gland. The middle thyroid veins are ligated, and the gland is rotated. The superior gland should be located deep to the plane of the recurrent laryngeal nerve and superior to the intersection of the recurrent laryngeal nerve and the inferior thyroid artery. The superior gland is often within 1 cm of the cricothyroid cartilage articulation. Blunt dissection of the fibroareolar tissue in this area facilitates finding both normal and abnormal parathyroid glands. Care should be taken to maintain excellent hemostasis, because blood that stains the tissue makes identifying the parathyroid glands harder and increases the risk of injury to the recurrent laryngeal nerve. Often, there is a covering layer of fascia just superficial to the parathyroid gland; once this is divided, the parathyroid gland generally presents itself with gentle blunt palpation in this area. The clefts within the thyroid gland are carefully examined to confirm that the parathyroid gland is not within a cleft and to make sure that the parathyroid gland has not been accidentally caught within the retractor and is not being retracted with the thyroid. If the superior gland is still not found, exploration proceeds to the common ectopic locations. Although identification of the recurrent laryngeal nerve is not always necessary, it is important and often helpful in cases in which a gland cannot be found. The superior gland is posterior to the plane of the recurrent laryngeal nerve and can often be found in the tracheoesophageal groove, in the posterior mediastinum, or adjacent or posterior to the esophagus. If additional exposure is needed, the superior thyroid artery can be ligated as it enters the superior aspect of the thyroid, and the thyroid gland can be further rotated anteromedially. In addition, it is sometimes helpful to divide the sternothyroid muscle. Often, an abnormal gland can be palpated before it can be seen. This is especially true of the superior glands, which migrate to posterior and deep locations. Finger palpation along the tracheoesophageal groove and along the esophagus down into the posterior mediastinum may lead to the area where dissection is needed to find the abnormal gland. Most normal parathyroid glands are light brown in color; this coloration helps distinguish them from the surrounding fat, which is more yellow. The parathyroid glands can often be teased out of the fat by means of gentle palpation with a Kittner or peanut dissector. The search for the inferior gland begins at the inferior and posterior aspect of the thyroid lobe and should include the thyrothymic ligament and the superior aspect of the thymus. The inferior gland is typically anterior to the plane of the recurrent laryngeal nerve and is often found just medial and anterior to the intersection of the recurrent laryngeal nerve and the inferior thyroid artery. With gentle retraction, the ectopic inferior gland can usually be pulled up into the neck and removed (see the image below). Patient had left substernal thyroid goiter and right substernal inferior parathyroid adenoma. Both thyroid goiter and parathyroid adenoma were removed through cervical incision. 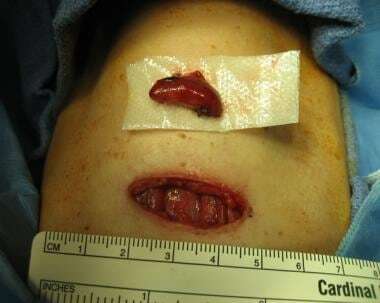 Parathyroid adenoma was removed by gently pulling up thyrothymic ligament; adenoma came up into neck with thymus and was removed in minimally invasive fashion through neck. It is essential to proceed in a systematic fashion, fully understanding and carefully documenting what was found and what was not. The surgeon must know which gland is missing because each missing gland has its own likely ectopic sites. If a normal parathyroid gland is inadvertently devascularized during the dissection, it should be set aside in saline for later reimplantation. The gland should be cut into 1 mm cubes and placed in 1 or more small pockets that are made within the sternocleidomastoid muscle. The area should be marked with nonabsorbable suture (eg, polypropylene) and with staple clips; this facilitates imaging and intraoperative identification should the patient becomes hyperparathyroid again in the future. As noted (see above) in Equipment, if a localization scan indicates a single parathyroid adenoma (the most common cause of primary hyperparathyroidism), many surgeons choose to terminate the procedure after the intraoperative PTH assay yields a level that is at least 50% lower than the starting PTH level and is within the normal range. The reported success rate with this method exceeds 95% and is comparable with that of traditional bilateral parathyroid surgery. [23, 11, 26] However, this does not guarantee the the patient will not have persistent or recurrent disease. The patient is much less likley to have persisent or recurrent disease if the PTH falls to the low normal level and/or continues to fall with subsequent PTH levels. If the patient has 4-gland hyperplasia or secondary hyperparathyroidism, then either 3.5 glands are removed or 4 glands are removed and autotransplantation subsequently performed. 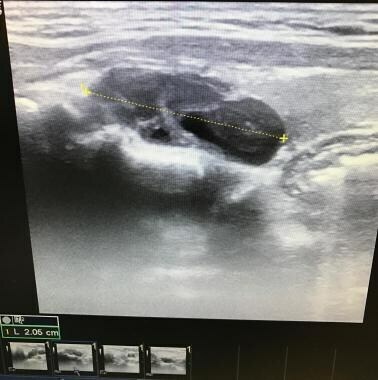 Alternatively, if there is a well-localized parathyroid adenoma on preoperative scanning (see the images below), a 2.0-2.5 cm incision may be made directly over the location of the gland. Dissection proceeds between the strap muscles and the sternocleidomastoid muscle and then directly toward the abnormal gland. However, if a parathyroid adenoma is not found or if the PTH does not drop sufficiently after the removal of the gland, the incision must be extended to allow a more formal operation of the type described above. Parathyroid sestamibi scan showing ectopic parathyroid adenoma located just below right submandibular gland. Direct approach to ectopic parathyroid adenoma seen in preceding parathyroid sestamibi scan. Preoperative imaging along with intraoperative parathyroid hormone (PTH) assessment allowed minimally invasive resection requiring only 20 minutes of operating time. 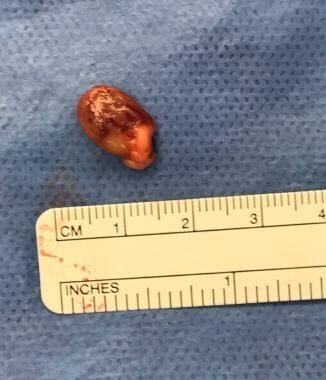 Historically, without preoperative imaging, the patient would most likely have undergone bilateral parathyroid exploration and, given the very unusual location, the case would probably have taken several hours. Resected ectopic parathyroid adenoma from just inferior to right submandibular gland. The gland weighed 4.243 g and parathyroid hormone (PTH) level went from 125 pg/mL before the skin incision to 25 pg/mL at 10 minutes after resection. 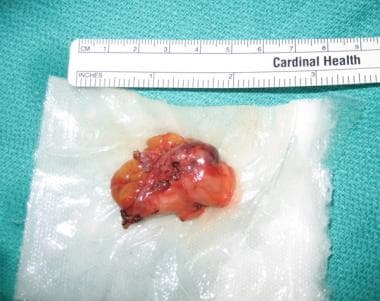 The small area of tissue projecting out was confirmed histologically to be normal parathyroid tissue attached to a larger hypercellular parathyroid adenoma. With parathyroidectomy, as with all surgical procedures, bleeding and infection are potential complications. Because parathyroidectomy is a clean operation and because meticulous homeostasis is crucial to its performance, both of these complications should be rare. As with thyroid surgery, there is a risk of injury to the recurrent and superior laryngeal nerves. In difficult cases, where the abnormal gland is not easily found easily, it is important to identify the recurrent laryngeal nerve, both to protect it from injury and to have it available as a landmark during the dissection. Failure to cure the hyperparathyroidism, persistent or recurrent hypercalcemia, and postoperative hypocalcemia are also potential adverse results of parathyroidectomy. If patients are receiving anticoagulants, these agents should be discontinued before surgery. If patients have significant medical problems, their medical status should be optimized before surgery. Preoperative parathyroid localization studies should also be planned and carried out. When parathyroid localization studies were first introduced, many surgeons maintained that the only localization necessary was locating an experienced parathyroid surgeon. At that time, a comprehensive 4-gland bilateral exploration was the standard of care. Technetium Tc 99m sestamibi was first discovered to have persistent uptake in parathyroid tissue during myocardial perfusion studies. Because it is quickly absorbed and retained by abnormal parathyroid tissue but quickly washed out from thyroid tissue, it is useful in the assessment of abnormal parathyroid tissue; the faster clearance from thyroid tissue facilitates identification of abnormal parathyroid tissue on delayed imaging. This technique allows identification of parathyroid adenomas both in normal and in ectopic locations. Ultrasonography often misses retroesophageal or mediastinal adenomas as a result of the shadowing effect of the laryngeal-tracheal complex and the sternum. It identifies 95% of adenomas weighing more than 1000 mg but fewer than 50% of adenomas weighing less than 200 mg. Many surgeons are now doing their own preoperative ultrasounds. Axial ultrasound view of a 2 gram left superior parathyroid adenoma. Sagittal ultrasound view of the same 2 gram left superior parathyroid adenoma. 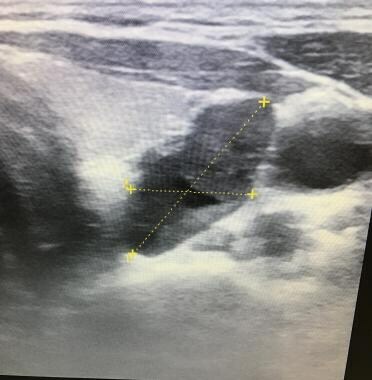 Intraoperative photo of the same left superior parathyroid gland seen in the above ultrasound. 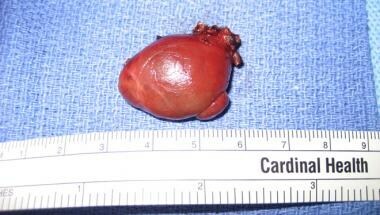 Intraoperative PTH went from 116 to 31 at ten minutes after removal and the level was 24 at twenty minutes after the removal of this gland. 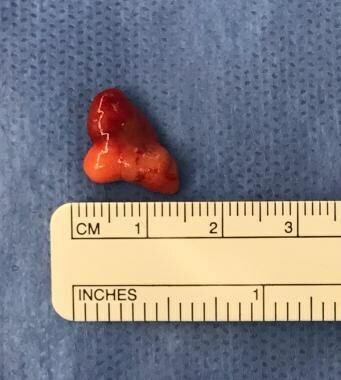 This left superior parathyroid gland weighed 2 grams. In addition to the basic equipment used to perform the operation itself, materials and devices for performing preoperative localization studies (see above) and intraoperative guidance studies (eg, intraoperative parathyroid hormone [PTH] assay; see Technique) may be required. If 4-gland parathyroid exploration is going to be performed, no special equipment for intraoperative assessment is needed. However, if more targeted parathyroid surgery is going to be performed, additional equipment may be required, such as a gamma probe (for radio-guided parathyroid gland identification and removal) or and intra-operative PTH assay. Other intraoperative equipment, such as tissue fusion devices (eg, LigaSure; Covidien, Boulder, CO) or ultrasonic dissectors, is used by some surgeons but certainly is not required. Some surgeons also use special endotracheal tubes with electromyographic (EMG) capablilities for intraoperative laryngeal nerve monitoring. Patient preparation includes adequate anesthesia and appropriate patient positioning. Surgery for primary hyperparathyroidism can be performed with either local or general anesthesia. Patients with localized scans who are at high risk with general anesthesia may be better off under local anesthesia with sedation. However, preoperative imaging does not always correlate with intraoperative findings and therefore the surgeon should always be prepared to do 4-gland exploration surgery. In such patients, and at times in patients who are under local anesthesia for targeted parathyroid adenoma removal, intraoperative conversion to general anesthesia is carried out. Local anesthesia eliminates the risk of intubation, shortens the recovery time, permits same-day discharge, and reduces cost. However, many surgeons who use general anesthesia with intubation for parathyroidectomy also find that they can discharge their patients home the same day after performing a targeted 1-gland or unilateral parathyroid operation. Many patients are also currently being discharged home the same day after having bilateral surgery. The patient is positioned with the neck extended to provide improved access to the lower neck. The arms are positioned along the sides to allow the surgeon and an assistant to stand on either side of the patient and operate comfortably. If intraoperative PTH levels will be checked, an accessible intravascular site (either venous or arterial) should be available. Using the reverse Trendelenburg position or simply elevating the back of the bed decreases venous congestion and helps minimize venous bleeding during the operation. Slough CM, Dralle H, Machens A, Randolph GW. Diagnosis and treatment of thyroid and parathyroid disorders. Bailey BJ, Johnson JT. Head and Neck Surgery - Otolaryngology. 4th ed. Philadelphia: Lippincott Williams & Wilkins; 2006. Vol 2: 1647-1655. Norman J, Lopez J, Politz D. Abandoning unilateral parathyroidectomy: why we reversed our position after 15,000 parathyroid operations. J Am Coll Surg. 2012 Mar. 214 (3):260-9. [Medline]. Michalangeli VP, Hunt NH, Martin TJ. States of activation of chick kidney adenylate cyclase induced by parathyroid hormone and guanyl nucleotides. J Endocrinol. 1977 Jan. 72(1):69-79. [Medline]. Heath DA. Primary hyperparathyroidism. Clinical presentation and factors influencing clinical management. Endocrinol Metab Clin North Am. 1989 Sep. 18(3):631-46. [Medline]. Carsote M, Paduraru DN, Nica AE, Valea. Parathyroidecotmy: is vitamin D a player for a good outcome?. Journal of Medicine and Live. October-December 2016. 9:348-352. Maruani G, Hertig A, Paillard M, Houillier P. Normocalcemic primary hyperparathyroidism: evidence for a generalized target-tissue resistance to parathyroid hormone. J Clin Endocrinol Metab. 2003 Oct. 88 (10):4641-8. [Medline]. Ozturk FY, Erol, S, Canat MM, Karates S, Kauz I, et al. Patients with normocalcemic primary hyperparathyroidism may have similar metabolic profile as hypercalcemic patients. Endocrine Journal. 2016. 63:111-118. Souberbielle JC, Cavalier E, Cormier C. How to manage an isolated elevated PTH?. Ann Endocrinol (Paris). 2015 May. 76 (2):134-41. [Medline]. NIH conference. Diagnosis and management of asymptomatic primary hyperparathyroidism: consensus development conference statement. Ann Intern Med. 1991 Apr 1. 114(7):593-7. [Medline]. Bilezikian JP, Potts JT Jr, Fuleihan Gel-H, Kleerekoper M, Neer R, Peacock M. Summary statement from a workshop on asymptomatic primary hyperparathyroidism: a perspective for the 21st century. J Clin Endocrinol Metab. 2002 Dec. 87(12):5353-61. [Medline]. Grant CS, Thompson G, Farley D, van Heerden J. 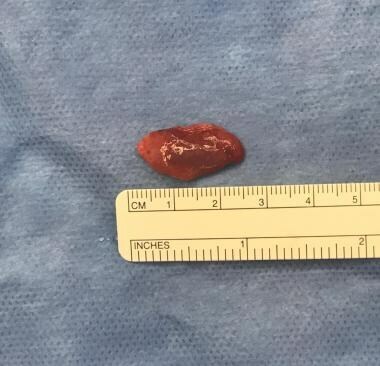 Primary hyperparathyroidism surgical management since the introduction of minimally invasive parathyroidectomy: Mayo Clinic experience. Arch Surg. 2005 May. 140(5):472-8; discussion 478-9. [Medline]. Morris LG, Myssiorek D. When is surgery indicated for asymptomatic primary hyperparathyroidism?. Laryngoscope. 2009 Dec. 119 (12):2291-2. [Medline]. Pepe J, Cipriani C, Sonato C, Raimo O, Biamonte F, Minisola S. Cardiovascular manifestations of primary hyperparathyroidism: a narrative review. Eur J Endocrinol. 2017 Dec. 177 (6):R297-R308. [Medline]. Eigelberger MS, Cheah WK, Ituarte PH, Streja L, Duh QY, Clark OH. The NIH criteria for parathyroidectomy in asymptomatic primary hyperparathyroidism: are they too limited?. Ann Surg. 2004 Apr. 239 (4):528-35. [Medline]. Silverberg SJ, Lewiecki EM, Mosekilde L, Peacock M, Rubin MR. Presentation of asymptomatic primary hyperparathyroidism: proceedings of the third international workshop. J Clin Endocrinol Metab. 2009 Feb. 94 (2):351-65. [Medline]. Marx SJ, Stock JL, Attie MF, Downs RW Jr, Gardner DG, Brown EM. Familial hypocalciuric hypercalcemia: recognition among patients referred after unsuccessful parathyroid exploration. Ann Intern Med. 1980 Mar. 92(3):351-6. [Medline]. Pelliteri PK, Sofferman RA, Randolph GW. Surgical management of parathyroid disorders. Cummings CW, Flint PW, Harker LA, Haughey BH, Richardson MA, Robbins KT, Schuller DE, Thomas JR. Otolaryngology Head & Neck Surgery. 4th ed. Philadelphia: Elsevier Mosby; 1998. Vol 3: 120. Smith JA, Stack BC. Pathophysiology of the parathyroid glands. Terris DJ, Gourin CG. Thyroid and Parathyroid Disease: Medical and Surgical Management. New York: Thieme Medical Publishers, Inc; 2009. 184-196/16. Stephen AE, Roth SI, Fardo DW, Finkelstein DM, Randolph GW, Gaz RD. Predictors of an accurate preoperative sestamibi scan for single-gland parathyroid adenomas. Arch Surg. 2007 Apr. 142(4):381-6. [Medline]. Norman J, Politz D. Prospective study in 3,000 consecutive parathyroid operations demonstrates 18 objective factors that influence the decision for unilateral versus bilateral surgical approach. J Am Coll Surg. 2010 Aug. 211(2):244-9. [Medline]. Siperstein A, Berber E, Barbosa GF, Tsinberg M, Greene AB, Mitchell J. Predicting the success of limited exploration for primary hyperparathyroidism using ultrasound, sestamibi, and intraoperative parathyroid hormone: analysis of 1158 cases. Ann Surg. 2008 Sep. 248(3):420-8. [Medline]. Lew JI, Irvin GL 3rd. Focused parathyroidectomy guided by intra-operative parathormone monitoring does not miss multiglandular disease in patients with sporadic primary hyperparathyroidism: a 10-year outcome. Surgery. 2009 Dec. 146(6):1021-7. [Medline]. Lew JI, Rivera M, Irvin GL 3rd, Solorzano CC. Operative failure in the era of focused parathyroidectomy: a contemporary series of 845 patients. Arch Surg. 2010 Jul. 145(7):628-33. [Medline]. Irvin GL 3rd, Solorzano CC, Carneiro DM. Quick intraoperative parathyroid hormone assay: surgical adjunct to allow limited parathyroidectomy, improve success rate, and predict outcome. World J Surg. 2004 Dec. 28(12):1287-92. [Medline]. Libutti SK, Alexander HR, Bartlett DL, Sampson ML, Ruddel ME, Skarulis M. Kinetic analysis of the rapid intraoperative parathyroid hormone assay in patients during operation for hyperparathyroidism. Surgery. 1999 Dec. 126(6):1145-50; discussion 1150-1. [Medline]. Proctor MD, Sofferman RA. Intraoperative parathyroid hormone testing: what have we learned?. Laryngoscope. 2003 Apr. 113(4):706-14. [Medline]. Seybt MW, Loftus KA, Mulloy AL, Terris DJ. Optimal use of intraoperative PTH levels in parathyroidectomy. Laryngoscope. 2009 Jul. 119(7):1331-3. [Medline]. Terris DJ, Stack BC Jr, Gourin CG. Contemporary parathyroidectomy: exploiting technology. Am J Otolaryngol. 2007 Nov-Dec. 28(6):408-14. [Medline]. Sokoll LJ, Remaley AT, Sena SF, Wians FH Jr, Wu J, Libutti SK, et al. Intraoperative parathyroid hormone. Laboratory Medicine Practice Guidelines: Evidence-Based Practice for Point-of-Care Testing. Washington, DC: National Academy of Clinical Biochemistry; 2006. 105-19. Kao PC, van Heerden JA, Taylor RL. Intraoperative monitoring of parathyroid procedures by a 15-minute parathyroid hormone immunochemiluminometric assay. Mayo Clin Proc. 1994 Jun. 69(6):532-7. [Medline]. Sofferman RA. Advance techniques in parathyroid surgery. Terris DJ, Gourin CG. Thyroid and Parathyroid Disease. New York: Thieme Medical Publishers, Inc; 2009. 234-243. Norman J, Chheda H, Farrell C. Minimally invasive parathyroidectomy for primary hyperparathyroidism: decreasing operative time and potential complications while improving cosmetic results. Am Surg. 1998 May. 64(5):391-5; discussion 395-6. [Medline]. Murphy C, Norman J. The 20% rule: a simple, instantaneous radioactivity measurement defines cure and allows elimination of frozen sections and hormone assays during parathyroidectomy. Surgery. 1999 Dec. 126(6):1023-8; discussion 1028-9. [Medline]. Greene AB, Butler RS, McIntyre S, Barbosa GF, Mitchell J, Berber E. National trends in parathyroid surgery from 1998 to 2008: a decade of change. J Am Coll Surg. 2009 Sep. 209(3):332-43. [Medline]. Schulte KM, Talat N, Miell J, Moniz C, Sinha P, Diaz-Cano S. Lymph node involvement and surgical approach in parathyroid cancer. World J Surg. 2010 Nov. 34(11):2611-20. [Medline]. Weber CJ, Vansant J, Alazraki N, Christy J, Watts N, Phillips LS. Value of technetium 99m sestamibi iodine 123 imaging in reoperative parathyroid surgery. Surgery. 1993 Dec. 114(6):1011-8. [Medline]. Terris DJ, Chen N, Seybt MW, Gourin CG, Chin E. Emerging trends in the performance of parathyroid surgery. Laryngoscope. 2007 Jun. 117(6):1009-12. [Medline]. Powell AC, Alexander HR, Chang R, Marx SJ, Skarulis M, Pingpank JF. Reoperation for parathyroid adenoma: a contemporary experience. Surgery. 2009 Dec. 146(6):1144-55. [Medline]. Coakley AJ, Kettle AG, Wells CP, O'Doherty MJ, Collins RE. 99Tcm sestamibi--a new agent for parathyroid imaging. Nucl Med Commun. 1989 Nov. 10(11):791-4. [Medline]. Taillefer R, Boucher Y, Potvin C, Lambert R. Detection and localization of parathyroid adenomas in patients with hyperparathyroidism using a single radionuclide imaging procedure with technetium-99m-sestamibi (double-phase study). J Nucl Med. 1992 Oct. 33(10):1801-7. [Medline]. Moka D, Voth E, Dietlein M, Larena-Avellaneda A, Schicha H. Technetium 99m-MIBI-SPECT: A highly sensitive diagnostic tool for localization of parathyroid adenomas. Surgery. 2000 Jul. 128(1):29-35. [Medline]. Pata G, Casella C, Besuzio S, Mittempergher F, Salerni B. Clinical appraisal of 99m technetium-sestamibi SPECT/CT compared to conventional SPECT in patients with primary hyperparathyroidism and concomitant nodular goiter. Thyroid. 2010 Oct. 20(10):1121-7. [Medline]. Taubman ML, Goldfarb M, Lew JI. Role of SPECT and SPECT/CT in the surgical treatment of primary hyperparathyroidism. Int J Mol Imaging. 2011. 2011:141593. [Medline]. [Full Text]. Ahuja AT. The thyroid and parathyroids. Ahuja AT and Evans R. Practical Head and Neck Ultrasounds. Cambridge University Press; 2006. 37-64. Tublin ME, Pryma DA, Yim JH, Ogilvie JB, Mountz JM, Bencherif B. Localization of parathyroid adenomas by sonography and technetium tc 99m sestamibi single-photon emission computed tomography before minimally invasive parathyroidectomy: are both studies really needed?. J Ultrasound Med. 2009 Feb. 28(2):183-90. [Medline]. Sofferman RA, Nathan MH, Fairbank JT, Foster RS Jr, Krag DN. Preoperative technetium Tc 99m sestamibi imaging. Paving the way to minimal-access parathyroid surgery. Arch Otolaryngol Head Neck Surg. 1996 Apr. 122(4):369-74. [Medline]. Harari A, Zarnegar R, Lee J, Kazam E, Inabnet WB 3rd, Fahey TJ 3rd. Computed tomography can guide focused exploration in select patients with primary hyperparathyroidism and negative sestamibi scanning. Surgery. 2008 Dec. 144(6):970-6; discussion 976-9. [Medline]. Chen H, Sokoll LJ, Udelsman R. Outpatient minimally invasive parathyroidectomy: a combination of sestamibi-SPECT localization, cervical block anesthesia, and intraoperative parathyroid hormone assay. Surgery. 1999 Dec. 126(6):1016-21; discussion 1021-2. [Medline].